Cabaret is a form of entertainment featuring comedy, song, dance, and theatre, distinguished mainly by the performance venue — a restaurant or nightclub with a stage for performances and the audience sitting around the tables (often dining or drinking) watching the performance. The venue itself can also be called a "cabaret." The turn of the 20th century introduced a revolutionized cabaret culture. 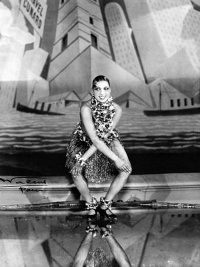 Performers included Josephine Baker and Brazilian drag performer João Francisco dos Santos (aka Madame Satã). Cabaret performances could range from political satire to light entertainment, each being introduced by a master of ceremonies, or MC. The term is a French word for the taprooms or cafés where this form of entertainment was born, as a more artistic type of café-chantant. It is derived from Middle Dutch cabret, through Old North French camberette, from Late Latin camera. It essentially means "small room." Cabaret also refers to a Mediterranean-style brothel — a bar with tables and women who mingle with and entertain the clientele. Traditionally these establishments can also feature some form of stage entertainment: often singers & dancers — the bawdiness of which varies with the quality of the establishment. It is the classier, more sophisticated cabaret that eventually engendered the type of establishment and art form that is the subject of the remainder of this article. Unless indicated otherwise, the text in this article is either based on Wikipedia article "Cabaret" or another language Wikipedia page thereof used under the terms of the GNU Free Documentation License; or on original research by Jahsonic and friends. See Art and Popular Culture's copyright notice. This page was last modified 06:57, 2 October 2014.